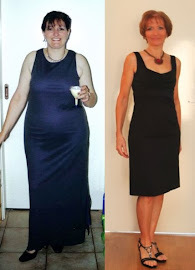 FitBody Fifty: Guess what I did today? We visited the Tutankhamun exhibition at the Melbourne museum this afternoon, which was pretty fabulous, in case you're wondering. Before we left, we wandered through the rainforest exhibition (my favourite) and then did a quick dash through the Melbourne exhibition (of course, saying a quick hello to Phar Lap while we were there). On the way to and from the museum, I made use of my phone's camera to capture a glimpse of my city. It's funny how your home town can look so different through a camera lens. Or when you actually stop to LOOK at things, instead of rushing past on your way to somewhere. 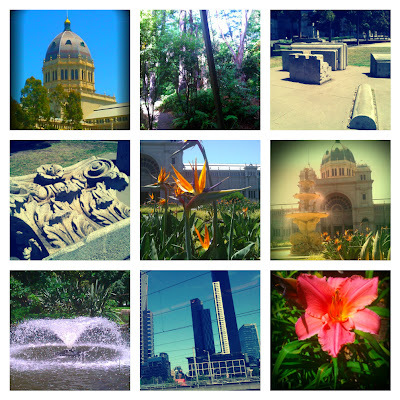 Row 1: Exhibition Building main dome; Rainforest exhibit, Melbourne museum; "Sculpture" made from salvaged parts of the demolished Colonial Mutual Life building, museum forecourt, Nicholson St.
Row 2: Close-up of part of the sculpture; Strelitzia, Carlton Gardens; Exhibition Building, facing Victoria St.
Row 3: Fountain, Carlton Gardens; Southbank viewed from a train approaching Flinders St station; Daylily, Carlton Gardens. Now I want to go back to Melbourne. It's been years since I was there last.